An emerald makes a striking engagement ring. For a special and unique twist, consider an emerald engagement ring. Emeralds originate from the beryl mineral, and they are most often mined in South America. They are not only known for their exquisite beauty but for various spiritual characteristics. Some believe that wearing an emerald will increase a person's clairvoyant powers, while others believe that emeralds have healing powers. A beautiful emerald engagement ring offers a unique symbol of love and a testament to the engaged couple's commitment. Emerald values are typically based on the color and clarity of the stone. Unlike some stones, the color of an emerald cannot be precisely defined. Emeralds may be blue-green or just green, but the most valuable color for an emerald is typically a blue-green. Stones with some brown or yellow coloring or hues are not considered as valuable. When searching for that perfect emerald, you want the color to be uniform throughout the stone. However, since there isn't one true color that an emerald must be, you can also look for a ring that works best for you and appeals to you personally. While some inclusions may be expected, and often do not detract from the brilliance of an emerald, others may lower the value significantly. One of the most serious types of inclusions is a feather. Feathers are fractures that may be found deep within the stone and could cause the stone to break more easily. Very minor inclusions may not be visible in deeper-colored stones. The transparency of an emerald can also be factored into determining the value of a particular stone. The stone should be clear with a uniform color rather than a cloudy one. Keep in mind that a darker emerald will not be as transparent simply because of its color. The most common cut is, of course, the emerald or rectangular cut, although a square cut runs a close second. There are other shapes such as round, pear, and heart-shaped; these can be significantly more expensive because of the precision necessary to make the cut. Emeralds can be fashioned in same manner as diamond shapes. 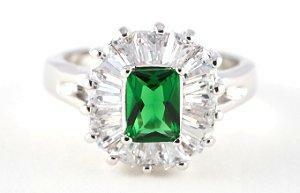 Most emeralds seen in jewelry stores today have undergone some type of treatment. If the jeweler you are dealing with doesn't volunteer this information, be sure to inquire about the extent of treatment a stone has undergone. One common treatment for emeralds is to fill in the cracks of a stone with epoxy resins or oils. These treatments should make the stone more transparent, and if the oils are colored, they will change the color of the stone somewhat. Extensive treatments indicate a lower-quality stone. Your jeweler should disclose to you anything that is known about the stone. If the stone has been treated, he should inform you as to the extent of that treatment. If the stone is actually a synthetic emerald, meaning that it has been created in a lab, that should be disclosed as well. If the jeweler states that it is not a synthetic stone, have him put that in writing. Natural emeralds are significantly more valuable. Finally, some emeralds are actually composite stones, which means that they may be composed of a small emerald that is mixed with a synthetic or imitation stone. Educate yourself, and be sure you know exactly what kind of emerald engagement ring you are purchasing.